Babchenko an Israeli Secret Asset? 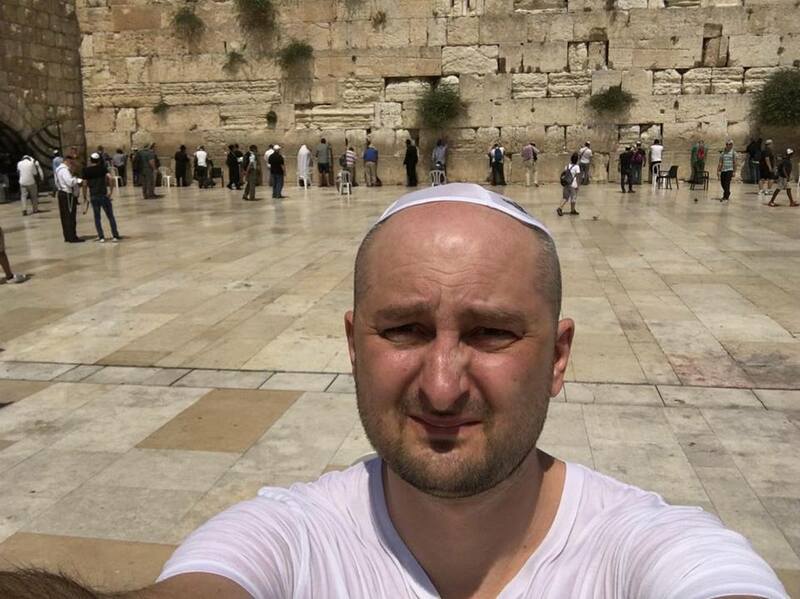 Arkady Babchenko, five years in the Russian military and subsequently a journalist critical of his own country and President Putin, is, it transpires, part Jewish with links to Israel. His maternal grandmother was Jewish. Apparently after fleeing Russia believing his safety was threatened, he briefly lived in Israel in 2017 before returning to the Ukraine. The Times of Israel reports he fled Russia after death threats were made against him for a Facebook post critical of the Russian regime. Babchenko wrote on Facebook in early 2017 that he was not sorry a plane crash killed ninety two (92) including a Russian military choir on their way to Syria, because Russia was carrying out air strikes in Aleppo. Whatever you may think of Russia's military involvement in Syria in general, and Aleppo in particular, it seems to me that to express delight over the death of so many humans, whether Russian or not, shows a certain degree of callousness and bad taste. It is enough in my mind to question the character of the man painted in the West as brave and principled humanitarian journalist, prepared to challenge corruption in his country. The question that certainly emerges in my mind, is to what extent Babchenko is a free and independent thinker and writer, or to what extent he has been controlled by Western/American/Israeli secret intelligence organisations? He was in Israel for about four weeks in June 2017 and whilst there he reportedly wrote several Facebook posts praising the country for its diversity and at one point said he was happy to live in a country where he doesn’t have to hear about Russian President Vladimir Putin. In September, he posted a picture of himself giving a talk at a synagogue, although it is not clearly stated where this was. Nor is it clear why he had gone to Israel, if he sought to remain there, who he met whilst there, or why he left. It is beyond belief that Israel's secret agencies would not have taken an interest in him whilst in the country and not impossible that when he returned to Ukraine he was not acting on their instructions. There is no doubt that his recent escapade of being shot dead 'on the orders of President Putin' was something thought up and executed by others and not him. It shrieks Secret Service involvement akin to the famous British dead body incident thought up by the British to fool the Germans into thinking it would attack Greece rather than Sicily in the Second World War. In this case it was initially used to promote the general anti-Russian propaganda: 'Russia the 'rogue state' prepared to target its nationals abroad'. It came after other cases of murdered journalists and the high profile incident of the Skripals in Britain, immediately blamed on Russia. Not only does the Babchenko case under-mine the credibility of the narrative that Russia is automatically to blame in such instances, but adds further doubt as to who was actually responsible for the Skripal poisoning. So Arkady Babchenko, this 'critic of the Kremlin', was said to have been shot dead in his apartment building in the capital city of Kiev on Tuesday 28th May 2018, but the very next day he was brought out alive during a press conference called to discuss his death! The Kiev Police had stated that Babchenko possibly could have been killed as a reprisal for his work as a journalist. Ukraine's Prime Minister Volodymyr Groysman, who happens to be a Ukrainian politician of Jewish decent, claimed Russia was responsible for the assassination. In other words all official sources confirmed Babchenko had been killed in a politically inspired assassination. When to the astonishment of the gathered journalists Babchenko reappeared - as if from the dead - the following day, what was the explanation for the extraordinary state of affairs and the dramatic change of plan? It was that (as reported by Wikipedia) the press conference was held by the Security Service of Ukraine (SBU). So its involvement does not have to be proved. The question is however, who or what actually controls the the SBU? was too and quite probably by the same organisations. According to SBU head Vasyl Hrytsak, Babchenko had collaborated with the SBU for a month, conducting a secret operation to expose Russian agents. (Previously in Kiev in 2016, journalist Pavel Sheremet and politician Denis Voronenkov, had been assassinated in 2016). The SBU said it had detained a Ukrainian suspect and an accomplice, who were engaged in preparations for the contract killing of Babchenko. The alleged assassin was reported to be helping the SBU with its investigation and that those who had wanted to assassinate Babchenko had been planning to kill 30 people in Ukraine. Well I never! All of this may or may not have been true but what is difficult to understand is why a fabricated death was necessary to discover the plotters? Is it not usual to detect them before the actual shooting takes place? And there is the further rather uncomfortable question, 'If the body in a pool of blood wasn't Babchenko, whose was it?' Was someone actually killed or was it all theatre? If so it proves the assertion that much terrorism is just that and that those that suggest it are not to be dismissed as 'fantacists' and 'conspiracy theorists'. And what were the factors that dictated such a volte face within 24 hours. Could it be that outside agencies either disagreed with the strategy or with one another and ordered a dramatic climb down with the best excuse that someone could come up with to save face? In earlier articles I have argued much of the contrived anti-Russian meme has been part of a much wider and deeper policy in which other violent and political events should be viewed. Clearly Russia has been the main obstacle to American/Zionist policy in Syria for which it must pay a price economically and militarily. Within this context, aircraft crashes and other events, with the loss of hundreds of lives, takes on a very sinister and dubious aspect. The official explanation of the MH17 flight over Ukraine is less than convincing. It also served the purpose of deflecting public attention away from a long planned and on-going offensive in Gaza that killed and injured thousands. The still unexplained loss of the identical MH370 plane shouts a military operation. Russian planes such as Tu-154 referenced by Babchenko that crashed over the Black Sea in December 2016 may raise similar questions. In February this year an Aseman Airlines plane crashed in Kohangan as it flew from Tehran to the southwestern city of Yasuj. Sixty six (66) passengers were initially said to be on board but one was said to have changed his mind and left. In another aircraft related coincidence, just hours before the shooting was reported, Babchenko wrote on Facebook that he considered the day a “second birthday”. It was the fourth anniversary of him missing a flight on a Ukrainian military helicopter that later was shot down in the conflict between Ukraine and Moscow-backed separatists in the eastern part of the country. By whom it was shot down is a separate issue. So if nothing else, the Babchenko incident proves that effectively Western/Israeli secret organisations are involved in 'death deceits', to promote despicable international political objectives, in which people are merely disposable pawns and the official explanation cannot be relied upon.